As a small child, you thought the world of your mom, dad, or significant adult figure. They were smart, strong, capable, talented and, in your young mind, they met your every need. When in their lap, you knew you were safe, cared for, and loved. Something happened later. A crack showed up on the surface. As you started and proceeded through elementary school, you learned this Super Person wasn’t super in everything. This happens to a boy named Will. A character in the musical BIG FISH (based off the book of the same name by Daniel Wallace which became a 2003 movie written by John August), Will struggles with his father, Edward, a traveling salesperson. Edward’s outlandish stories do the opposite of what he wants them to do: they keep pushing Will away. As Will becomes an adult, the two become estranged. Both grown men are storytellers. Edward fabricates, whereas Will, now a professional reporter, investigates. One lives on fact, the other on fiction. And ah, there’s the rub. In the musical, I play the role of Edward who is always trying to motivate or brighten someone else’s day. Edward’s overarching goal, however, is to bring back life, love, and stories to his son. Early in the show, Edward, who at this point is a teen, is shown how he will die. As a result, Edward lives his life bravely, boldly, and beautifully. This speaks to Christianity. While followers of Jesus do not know how they will die, they know what happens after death—which is eternal life. Knowing how this life ends changes everything for the Christian because we live our lives not in fear but with faith. Oh, yes, the cracks we see in others (like those young Will saw in his dad) are still there. The cracks we see in ourselves and the world are still there, too. Life can be hard for the Christian. It can certainly be painful at times but knowing of—and living for—eternal life changes everything. And Jesus, like Edward, told stories (parables). When Will investigates Edward’s stories, the hardnosed reporter learns about his father’s unquestionable and unfailing love. We can learn about our Father’s unquestionable and unfailing love, too. When we do, we understand God sent His Son, Jesus, to death so that we who seek Jesus can know eternal life. When we know eternal life, we live like Edward—with great hope and profound joy. Edward has what he calls “ambitious cancer” and does die. But what he teaches Will about life enables all of us to live as we’re called to live—with great hope and profound joy. This blog first appeared in The Susquehanna Independent on July 11, 2018. 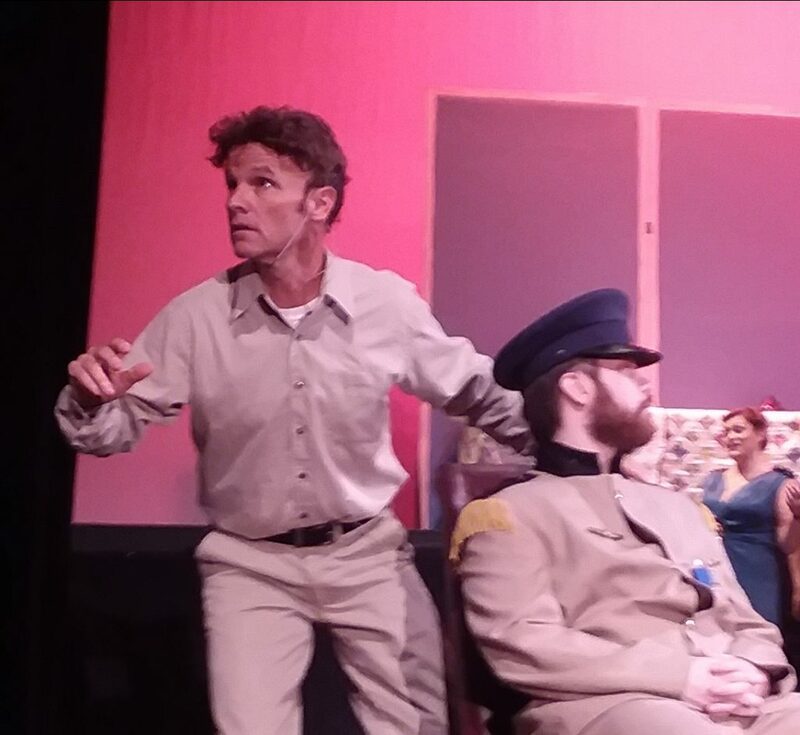 Photo credit: Margaret Lyon Smith (Edward “protects” General Patterson played by Caleb Park (Act 2, Scene 1).